Like most of the country this past week, I ate waaaayyy too much over Thanksgiving. Too many desserts to count – who can say no to ricotta pumpkin cheesecake? I learned I definitely cannot! And so many savory carbs like bread, mashed potatoes, candied sweet potatoes, rice and gandules, russian potato salad….ehhh. Needless to say, it’s only the beginning of December and already the holiday pounds are starting to creep up on me. I don’t want it to get out of hand so I’ve decided to start my “new year’s resolution” early – instead of January, why don’t we start in December IN BETWEEN all of the horrible eating that accompanies this time of year? This will be a mini-series of posts as I go along my holiday season natural detox diet. There will be cheat days, of course, on the days that I have a party or family gathering, but I will limit them and also keep portions in check. Everything in moderation! This time of year is also one of the busiest, meaning that I don’t have a lot of prep time for my healthy meals. I’m looking for quick, cheap and healthy meals and snacks. So far I raided my local Publix who had a sale on their steam-in-bag vegetables. I love edamame, but had actually never made it at home. 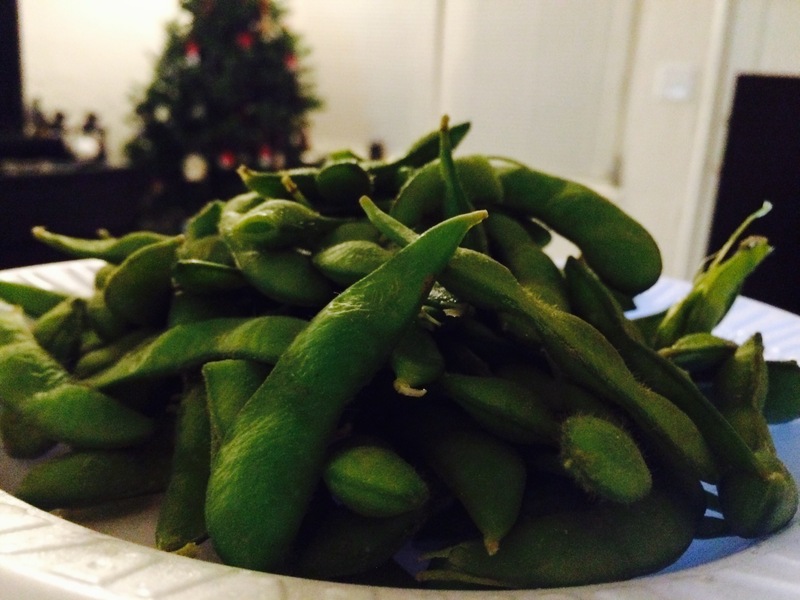 Typically in restaurants it comes covered in salt or sauces, which are not part of my holiday detox plan, so the Publix brand edamame is a perfect snack or side dish being that the ingredients listed are just: edamame! Since I’m a glutton, I need these nutrient dense, low calorie options so I can eat large quantities. I ate the ENTIRE BAG as part of my dinner yesterday and it came out to only 275 calories, 8.8 grams of fat, 27.5 carbs and it gave me a whole 12.5 grams of protein. A great way to add bulk to your diet without packing on the calories. It’s super easy to make: pop in the microwave for 5-6 minutes, let sit for a minute or so to cool and then eat. For the holiday detox, make sure not to add any salt or sauce. The more you eat veggies on their own, the more your taste buds will become accustomed to not needing as much salt. Also make sure to drink as much water as you can throughout the day. I try to drink about 16 oz an hour, sipping constantly. Your body will adjust to the increase in your water intake after a few days, but the first couple of days you will go to the bathroom a lot more often. This is great for your whole body, giving your skin a great glow and also cleaning out your organs. You don’t need to do an expensive juice cleanse or detox pills to really clean up your body and your nutrition. Focus on lots of water, cutting back on refined sugar and sodium, as well as eating lots of whole foods. If you’re struggling with flavor, try adding fresh garlic or herbs to your food. Make sure you don’t use any mixed seasonings that have sodium. You’ll want to limit your sodium intake on your “clean” days as much as possible! Before we start cooking, let’s first imagine we are gliding down a canal in Bologna, Italy in spring with beautiful flowers gracing the balconies and friendly Italians waving as we pass. Somewhere off in the distance a man with a deep baritone voice is singing as he kneads dough to make delicious spinach tagliatelle pasta. We stop at a market to pick up the freshest, most vibrant cherry tomatoes, fire roasted red peppers, some robust balsamic vinegar and a basil pesto sauce made fresh that morning by the world’s most adorable grandmother. Of course we can dream up the best ingredients possible, but we all know that I’m stuck in a city apartment the size of a closet and cooking with the best I can find in my local market. I was able to find some amazing fresh spinach tagliatelle, you can substitute dried if you don’t have this luxury. And I purchased a jar of great basil pesto as well as a jar of fire roasted red peppers, both of which should be easy enough to find in most supermarkets. 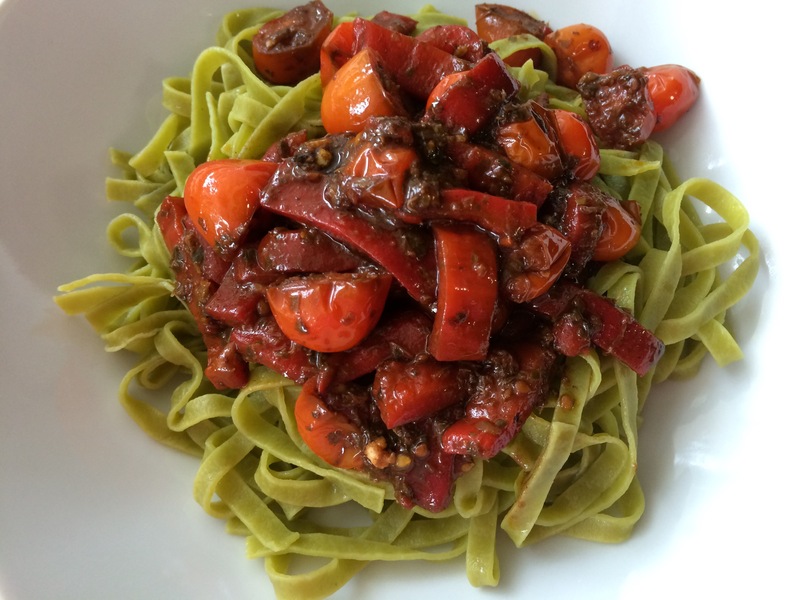 I already had a great Modena balsamic vinegar at home and some cherry tomatoes that needed to be used – and voila, the quickest gourmet weeknight dinner ever. If you have 15 minutes, you have enough time to put this on your table tonight. The below recipe yields enough for a quick dinner for one or two, but can easily be adapted into dinner for a family of any size. 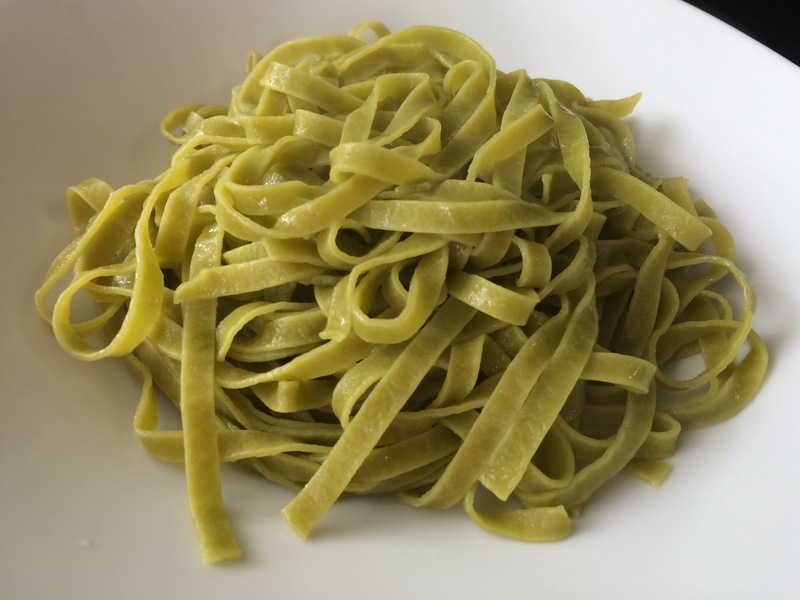 Boil water in a medium sized pot and cook the spinach tagliatelle until al dente, time will vary depending on whether you purchase fresh or dried pasta. 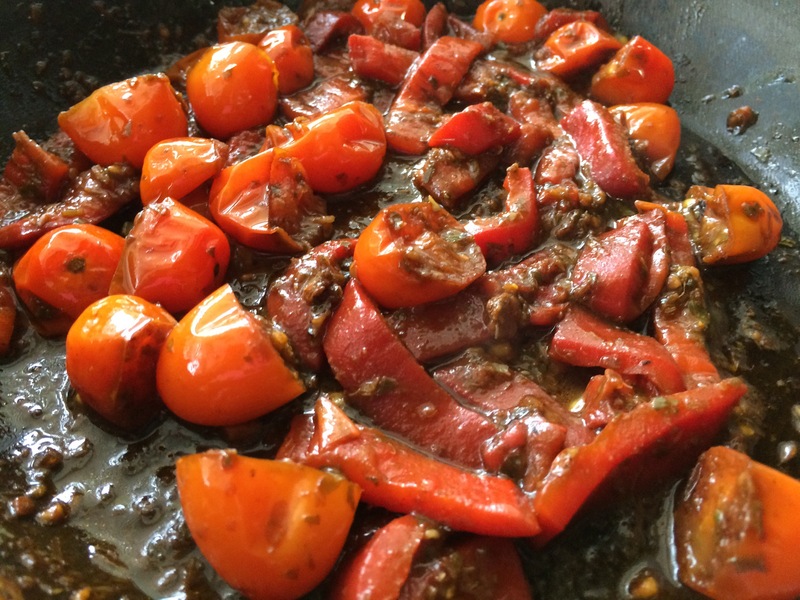 In a separate pan on medium-high heat, sauté the halved cherry tomatoes, the minced garlic, and roasted red pepper strips until heated through and slightly browning. Add the basil pesto and the balsamic vinegar to the pan and turn off the heat, stirring constantly until heated through and well incorporated. Serve the sauce over the cooked pasta. Blue Apron is letting our first 50 readers get 30% off their first Blue Apron order – visit https://www.blueapron.com/vegontherun for all the details! With so many meal delivery services on the market today, it’s been hard to sift through them all to see which are really worth the price. It’s true, $60 for three meals for two isn’t cheap, but if you calculate it in comparison with ordering take out on busy evenings, this becomes much cheaper. Blue Apron is the first meal delivery service I’ve tried where you cook your own meals. I like the idea since I do love to cook, yet still giving me three nights off from meal planning. All of the meals are listed as two portions unless you purchase a larger package, however I’ve found that some of the meals do give me enough to feed three. Blue Apron will hold your credit card information on file and you choose which weeks you would like to receive the delivery. You enter into the site, go to the Delivery Schedule section and can choose to skip one or all of the upcoming deliveries. You have until one week prior to finalize your selections. This gives you enough time to review the upcoming menu and decide if you’d like it to be delivered. I’ve been a member of Blue Apron for a few months before I took the leap, as I just wasn’t sure if I’d like the concept. They did not ever charge me anything for any of my skipped weeks. There are not many ways that you can customize the menu, you choose if you are vegetarian (at this time there is no vegan option) or if you eat meat, pork or seafood. However you can review the menu before ordering for that week, so you are able to skip that delivery if there are ingredients you do not like or have allergies to. Jessica and I shared this delivery, she prepared the Summer Saute, while I prepared the Potato Rosti and the Quinoa Tabbouleh & Fairy Tale Eggplants. All the ingredients were easy to split between us, so this is an option to split with a friend or family member. The box arrives via courier with ice packs to maintain freshness. You will need to refrigerate the ingredients as soon as possible, but it does stay fresh for a few hours after delivery. All of the ingredients will be labeled with what they are (i.e. carrot, eggplant, basil, spice mix) and some will be inside paper bags with the recipe label (i.e. summer saute). You will also receive three recipe cards that have pictures and legible, easy to follow, step-by-step directions on how to prepare each meal. You simply read the card, choose the ingredients needed for that recipe and follow the detailed instructions. The two meals I prepared, the Potato Rosti and the Quinoa Tabbouleh & Fairy Tale Eggplants, took less than 45 minutes each to prepare, and that was with photos and notes in between to make this review. I can easily say that each could take only 20-30 minutes from start to finish if I hadn’t stopped in between. This is a great option on hectic nights, as usually it takes just as long to decide on a restaurant, order and pick up a take-out meal. The meals were very healthy, delicious and even my meat loving fiancé loved them, he especially liked the Potato Rosti. The Quinoa Tabbouleh & Fairy Tale Eggplants was only enough for two servings, however the Potato Rosti would have been enough for three to have a nice meal. Overall I think this is a great option for those hectic weeks where I know I’ll be tempted to order take-out or delivery. I loved that the ingredients are fresh, whole ingredients, which is a much healthier alternative to many hectic mid-week meals as well. With each meal averaging about 500 calories, I could definitely see this as an accompaniment to a weight loss plan. Thanks Blue Apron for letting us try out your service and I look forward to ordering again in the future! It’s that time of the year again! Miami Spice offers three course tasting menus to some of the hottest restaurants in South Florida. Lunch menus are $23 pp and Dinner $39 pp. We have scoured the menus and created this list of restaurants that offer vegetarian options for their Spice menus. *All meals listed have vegetarian options for appetizer, entrée and dessert. Meals with vegan options have the word vegan in bold. View the full guide HERE! Have you heard of Orangetheory Fitness? I have been hearing people talking about these classes for a few months now, but my aversion to boot camp style fitness classes has made me shy away from it. Yesterday I finally conjured up enough courage to go and check them out, and I’m so glad that I did. It was so much fun, challenging yet not overwhelming as I had been afraid it might be. A little background on me: I am 26 years old, active on and off but certainly not an athlete. I am slightly overweight, BMI of about 26, and have never been religious about working out. I was afraid that I would get there and be way too out of shape to keep up, but the class really is tailored for anyone. The Orangetheory next to my house offers three free classes and I was able to make an appointment to come the same I called. When I arrived the manager greeted me and explained how the classes work, handed me a heart rate monitor and introduced me to the instructor. The instructor, Kelley, then took me around to the different machines and explained how to use each one. It is important that you come about thirty minutes early your first time so you can have this instruction, otherwise you may be lost during the class. The class itself is fast paced, but if you pay attention to the instructor you will be able to follow along. Your heart rate will be shown on a screen for everyone to see so that the instructor can make sure you are getting as much out of the class as you can. This is great, as you aren’t competing with the others in your class, who will most likely be at different fitness levels, but rather you are competing with yourself. At the end of the class the instructor will look over your heart rate statistics to see if you got into the “orange zone” for at least 12 minutes, where the name Orangetheory comes from. The logic behind this is that if you are in the orange zone for 12-20 minutes of your work out that you will spike your metabolism for up to 36 hours. During the class you will be on a treadmill for about 30 minutes using one of three programs: power walker, jogger or runner. The instructor will call out instructions for each level as the class progresses. The other 30 minutes is a mixture of the rowing machine, free weights and body weight exercises. The instructor at my Orangetheory was really great about paying attention to the newcomers and making sure our form was correct during the free weight and body weight exercises, which was wonderful for me as it was the first time I was doing many of these. After the class is over Orangetheory will e-mail you a report of your heart rate, calories burned and your time in each heart rate zone. This is great for tracking your own progress. Memberships aren’t exactly cheap, but are on par with many of the comparable gyms in my area. Single classes are $25, the basic membership (4 classes per month) is $59, the elite membership (8 classes per month) is $99 and the premier membership (unlimited) is $159. Additional classes for basic are $14 and elite are $12. You can also use your membership at any Orangetheory location. I’ve only done one class so far, but I signed up for the elite membership and am thinking about switching to the premier. I’ll keep you posted on how it’s going! I’ve been so busy these last six months and it was left up to Jessica to keep up the blog (she did a great job, thanks Jess!!). Finally I am back in town and ready to share all of my experiences with our readers. Since I last posted I’ve been to Orlando, Denver, New Orleans, Lisbon (Portugal), Vaduz (Liechtenstein), Munich (Germany), Baden Baden (Germany), Innsbruck (Austria), Chur (Switzerland), Fussen (Germany), Frankfurt (Germany), Strasbourg (France) and several other cities in Europe that would make this list way too long. I won’t have updates from all of these places individually, but I plan to post as much information as I can on vegetarian eating in these regions. A while ago I posted some pictures on the Facebook page (if you don’t follow us on Facebook, please click here!) of a meal I had in New Orleans that was amazing. Away from the hustle and bustle of the touristy side of Bourbon street lies Bennachin Restaurant, an African restaurant with amazing food and prices. If you are looking for a unique experience while visiting New Orleans, you should definitely give them a visit. I have been wanting to try Ethiopian food, but could never find an African restaurant from any country in South Florida. Bennachin focuses on cuisine from Gambia and Cameroon, catering heavily to vegan and vegetarian diners as well as meat eaters. The interior has an intimate, homey and inviting atmosphere that put us at ease immediately. The staff were so friendly and all of the guests were also helpful when it came time to order. The menu was foreign to us, but we asked guests around us what they were eating and chose items that looked good. I ordered Akara (black-eyed pea fritters, $4.50 VEGAN), Kone ni Makondo (Black-eyed peas in onion and tomato stew served with coconut rice and fried ripe plantains, $13.95 VEGAN) and Makondo Yogurt (fried plantains with yogurt sauce, $5.00 VEG/DAIRY). The portion sizes are enormous here and I really didn’t need any appetizer or dessert, but I was so intrigued by everything I wanted to try as much as I could. Unfortunately we only learned of their famous Jama-Jama (sautéed spinach, $4.50 VEGAN) after ordering, which is a hit at the annual Jazz and Heritage Festival. When I am in New Orleans again, I will definitely go back and order it. The restaurant has been a staple of New Orleans since 1992 yet many tourists don’t get to experience it, even though it is well within walking distance of the tourist area. Located at 1212 Royal Street, it is only one block off of Bourbon Street and less than a mile from Canal Street. Their full menu and more information about the restaurant can be found on their website at http://www.bennachinrestaurant.com/. Ghee is traditionally used in Indian, Pakistani, Bangladeshi, Nepali and Sri Lankan cuisine, however versions of it are used throughout the world. It is very similar to clarified butter and made almost in the same way, just cooked a bit longer until the milk solids are browned. While not vegan, the process of making Ghee removes all of the milk solids, so it is a safe alternative to those with milk/lactose allergies. The flavor of your Ghee will depend greatly on the quality of the butter you start with. The best Ghee will come from grass fed cows, best if you can find fresh butter from a local farmer. If you are not near a farming community and live in the United States or Canada, Kerrygold butter is also a great alternative. Make sure you buy the full fat, traditional Kerrygold if you choose that route. I am most familiar with the traditional uses of Ghee in Indian cooking, which they use to cook rice, dosas, curries and many other popular items. Ghee is also frequently served on the side for dipping in Indian cuisine. Naan, one of my favorite breads in the world, is usually brushed with Ghee while cooking to give it that sweet, buttery flavor. Ghee can be used to cook almost anything requiring the use of butter or oil, and when prepared with high quality butter it will contain no trans fats. So while Ghee is 100% fat, many doctors agree it is much healthier than many oils. Trans fats have been shown in laboratory testing to raise the risk of heart disease. Be careful if you choose to purchase pre-made Ghee instead of making your own, as there are many companies that market as “pure Ghee” when in fact they use vegetable oils containing trans fats. When made properly, Ghee is aromatic and nutty, with a hint of sweetness that lends itself to a variety of dishes and cuisines. Melt butter in a large pot over medium heat, stirring constantly until butter foams and starts to boil. Lower heat to medium low and let simmer, do not stir in this phase. Allow the butter to continue to simmer until the foam disappears and the butter starts to clear. While waiting, place your double mesh strainer over the mixing bowl with the cheesecloth laid over the strainer. You will see the milk solids begin to form, stir gently a few times just to let the milk solids fall to the bottom of the pot. Keep simmering, stirring occasionally so the milk solids don’t stick. Your Ghee will be finished cooking once the milk solids are a medium golden brown and the butter is finished foaming. Immediately pour the Ghee over the cheesecloth to strain out the milk solids. Some may choose to discard these, others can follow my short recipe below for a delicious treat to make with these. Pour into glass jars for storage. Your Ghee should be a lovely clear gold color, which will solidify as it cools. It is now ready for use! If you do not have a dairy allergy, there is no reason to discard the delicious milk solids that are left over from your homemade Ghee. They are very simple to make and are a great way to enjoy the fruits of your Ghee labor right away. Combine the milk solids, sugar and wheat flour in the same pan you just made Ghee, mix well to fully incorporate and heat over medium low until golden brown. In separate pan, lightly fry the cashews in two tablespoons of Ghee. Add cashews to the wheat mixture and incorporate by hand, adding the remaining tablespoon of Ghee if mixture is not wet enough. Begin hand forming small balls in your hands and set out on parchment. These can be eaten immediately or cooled and eaten at room temperature. Either way, they are delicious!